Winners of the Profoot insoles! 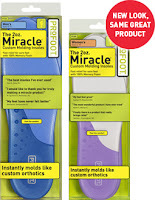 The great folks of Profoot offered two pairs of insoles for me to give away to two lucky readers of Mom's Home Run. What's so great about these insoles you ask?! These insoles are different from you average insole because of the layer of advanced Vita-Foam MT. This allows them to adjust to the shape of your feet, thereby creatig a custom fit to any pair of shoes. Gotta love that! What's the company slogan of Profoot? In order to participate I asked you to answer the following question: 'What's the company slogan of Profoot?' And the correct answer is…. 'The Smart Choice in Footcare'. Almost everybody got it right except two. Out of the right answers I drew two winners, and their names are: Maria Balmeo and Mary Jo Dempsey. Congratulations! You two will be walking on sunshine!